Just the Facts. No Drama. 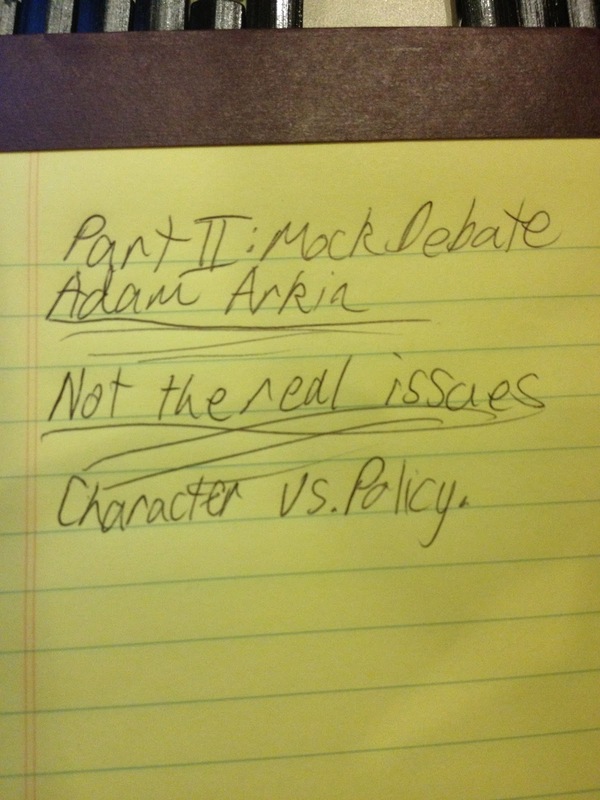 The idea behind the debate structure that this episode floats is perfect and, based on the clip from an actual CNN debate (A debate which hadn't happened yet based on the date this show was supposed to be happening. The first CNN debate was not until June 13th. ), it is revolutionary and necessary in order to actually find out what the candidates really believe. In spite of all his good intentions, it appears as though Will has an allergy to the real issues. There are some moments where he could have nailed it, but sticks with media sensationalism over true examination. The moment when he questions (Gary Cooper as) Ron Paul about the pamphlets released by a company he owned Will misses the point. Ignoring the consistent timing issues on the show and assuming that everything we know about these pamphlets was known at the time of the mock debate, the question should have been something more like, "A company you founded and ran published pamphlets with racist, anti-semitic, and homophobic content. You yourself have denied knowledge of these statements at the time of their printing. Others claim that it was done in an effort to improve business. An effort that was successful. But, I'm not as concerned today about their origin as whether or not you agree with any or all of the inflammatory statements contained in them. Did you at the time of their publishing, and do you currently, agree with those inflammatory statements?" There are many other questions which should be asked in this format. One such question is this, "If you were to become president, and a bill ended up on your desk that effectively overturned Roe v. Wade, would you, or would you not, sign that bill?" Simple question with a straightforward answer. Another, at this point, is, "Do you think the individual mandate in "Obamacare" is constitutional or not?" 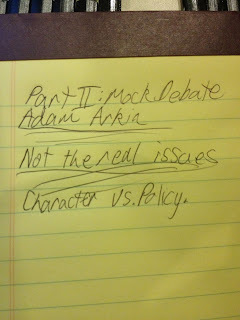 This one would require more follow up questions to get a clear picture of a candidates ideas and understanding of the Constitution. But, it would be worth the time. The character and values of our President are important, but a man with apparent marriage issues can do a good job. Just ask a Democrat about President Clinton. And a man with an apparently great marriage can do terribly. Just ask almost anyone about President Bush (43). The thing that matters more are how that character and those values will inform his decisions as President. That is what the debates should reveal to every voter. Not how many ex-wives a candidate has. In your unpersuasive apology for Newt Gingrich's marital infidelities -- like any AM squawk radio host -- you scramble to excuse it by searching high and low for some moral equivalency on the other side, imagining that it wipes the slate clean. You are as mistaken as you are facile. See, unlike Newt, Clinton never tried to wrap himself in the mantel of the defender of "family values" and never voted to condemn someone else's affair while conducting one of his own. I'm not sure how you read that as an apology for Newt being an adulterer. In fact, I never brought it up. You are quite off base. Please don't misread what I write in order to make yourself angry. I'm not here to inflame, just to inform. Copyright 2012-2013 by Brian Waddell. Picture Window theme. Theme images by mammuth. Powered by Blogger.